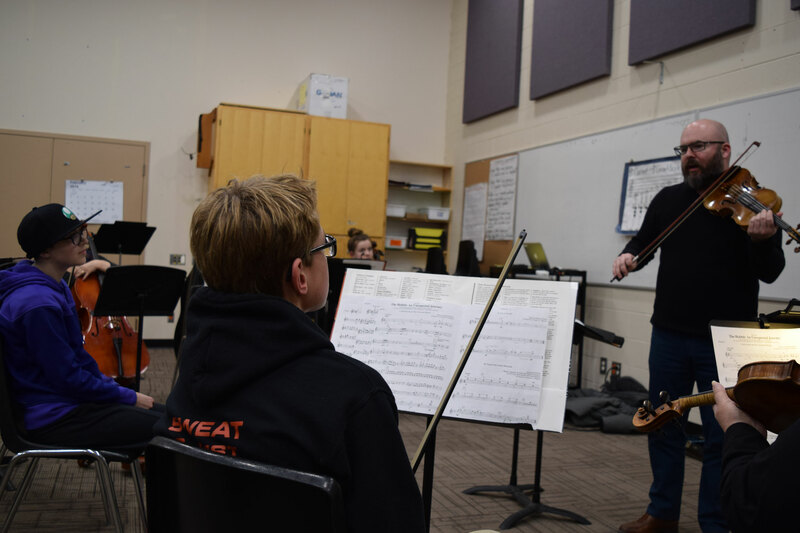 The SweetWater Music Festival gave local music students unique opportunity to interact and learn about music from two outstanding Canadian classical musicians on Tuesday, March 19. SweetWater Artistic Director and renowned violinist Mark Fewer along with clarinetist and Western music instructor Jana Starling visited two Owen Sound schools as well as conducting a session with Owen Sound Music for Youth later that same day. A key SweetWater goal is to connect local youth with professional musicians from beyond the Grey Bruce area. In 2018, SweetWater arranged five school visits by visiting musicians as well as a session with Owen Sound Music for Youth. Jana Starling, an accomplished musician who has performed worldwide including with the Phoenix Symphony Orchestra, worked with music students at Owen Sound District Secondary School late morning and early afternoon. The students greatly benefited from her experience as an Assistant Professor at the Don Wright Faculty of Music at Western University. Mark Fewer gave junior and senior students at Alexandra Community School a sense of what being a professional musician is all about including performing a few pieces on his violin. Along with being the co-founder of SweetWater, Fewer has performed in some of the world’s greatest concert halls. Fewer has also been a dedicated teacher for 20 years and currently is part of the music faculty at the University of Toronto. Early evening the two musicians worked with young musicians from Owen Sound Music for Youth. During the group’s rehearsal, Fewer worked with the string section and while Starling worked with the woodwind, brass and percussion section. Their guidance over the evening will help the young players prepare for a concert to take place on April 30. These special music workshops are not something local schools or other local music organizations can typically arrange in-house due to available resources. SweetWater considers it essential to support music education wherever possible. In September, SweetWater will once again be arranging school visits by featured performers who will be in the area for SweetWater 2019. SweetWater’s outreach education programs are supported in part by the Community Foundation Grey Bruce and Leflar Foundation.